Last night the minxes went out on their first night guising. It was just a short 15 minute visit to 4 neighbours, we were home by 1815hrs, they troughed sweets and chocolate for the next hour, then squealed and shouted and argued on a sugar-rush high until past 2130hrs. We only got 2 small groups of guisers ourselves. Pre-sweeties. The post-sweeties photo is much the same, but 7 feet higher, on the ceiling. At 15 mins till The Boss came home and we were due to go out, all 3 girls suddenly changed their minds about what they wanted to wear out. Thank God for facepaint close to hand…! And baggy outfits that you can stuff lots of clothes layers underneath – like Hallowe’ens when I was little, it was *cold*! At our first neighbour, Maxi and Midi wrestled over who would ring the doorbell. Midi wished the surprised neighbour a cheerful “Happy New Year!” while Maxi announced, “Hello we’re guising!” As opposed to just cutting about like a cat. For fun. As is customary. Mini just chanted: “Choc-choc…”. Only Maxi was confident enough to do her wee turn: she smartly walked down the path to the road where she held her tail and skipped, pirouetted and pretended to tap-dance to the consternation, giggles, then a wee bit of pride from her 2 parents. Laden with sweeties, we went back up the hill to the next neighbour’s house with the porch light on. This time Maxi’s dance was more tap-dance and Midi decided to sing. And how she sang! Where did my little thug grow such a sweet little tuneful voice? She sang of a little seed, autumn and Harvest, then ended it with a random 2-liner about how the seed turned into a ghost and ate everyone up. I think it’s the bad influence of a mother who makes up alternative, ‘funny’ lyrics to nursery rhymes (I defy anyone to keep singing them with gusto and a po-face after 6 years – I need a bit of entertainment now and again…). At the next 2 houses Midi settled for jokes (typical 4 year old stuff – more a statement than anything vaguely funny) and Maxi threatened to bring down the wall hangings with her dancing. Mini kept her acting to a simple smile shyly from behind mine or her Daddy’s legs. Shy? Brilliant acting – obviously a future Dr Who companion in the making. Back home, Midi coyly asked if she could eat 3 or 4 sweets. “OK, just this once” soon turned into “Fill your boots until 7 o’clock, then it’s tidy-up and bath time!” By the time Maxi’s thick mane was finally almost dry at 9, she was already looking forward to Bonfire Night. Just like her mother! 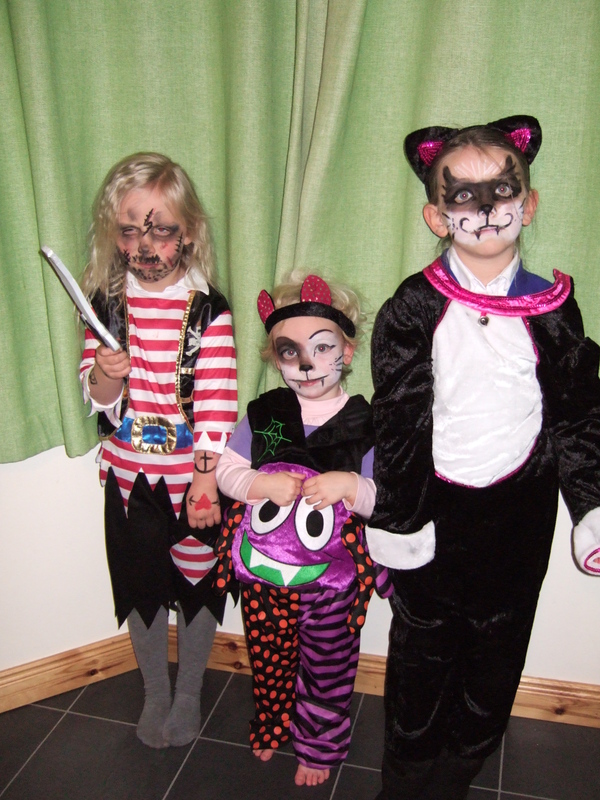 This entry was posted in baby milestone, Out and About, the things kids say and tagged guising, Halloween, trick-or-treat by GrumpyOldTrout. Bookmark the permalink.